, a learned orientalist, was born at Erfurt in Thuringia, June 15, 1624, of one of the best families in the city, then in reduced circumstances. He began his studies at home, under very insufficient masters, and having acquired some knowledge of the Greek and Latin languages, applied himself to the French, Italian, and Spanish, and afterwards to those of the East. He also made some progress in physic and law, but without any view to a profession. 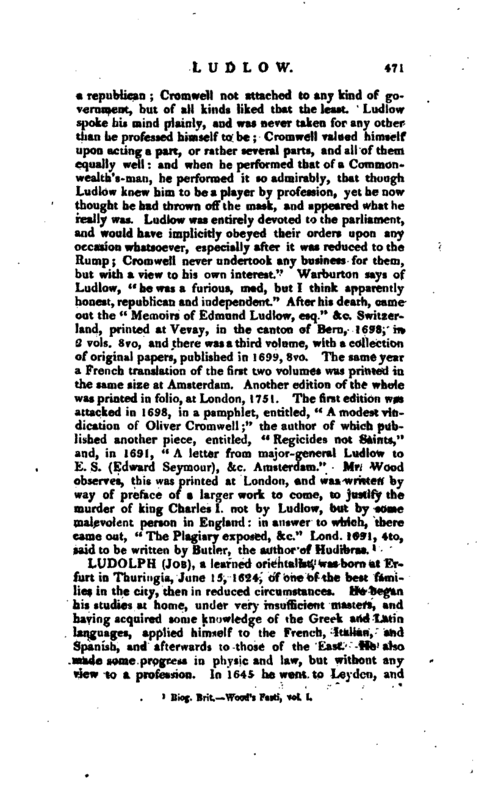 In 1645 he went to Leyden, a | studied the languages under Erpenius, Golius, and other: eminent teachers, and likewise maintained some disputations in law. After residing here ahove a year, he was appointed travelling tutor to a young man of family, with whom he went to France, and at Caen contracted a friendship with Bochart, and taught t him the elements of the Ethiopic language. He afterwards went with his pupil to England but the rebellion being at its height at this time, he soon returned to Holland. The baron de Rosenhahn, ambassador from Christina queen of Sweden at the court of France, happened to have in his retinue a brother of Ludolf, who recommended our author to that nobleman so effectually, that he sent for him from Holland to Paris, to be preceptor to his two sons. Soon after, in 1619, he sent. him to Rome, to search for papers and memoirs, which John Magnus, archbishop of Upsal, was said to have conveyed formerly to Rome, and which Christina was desirous to recover. 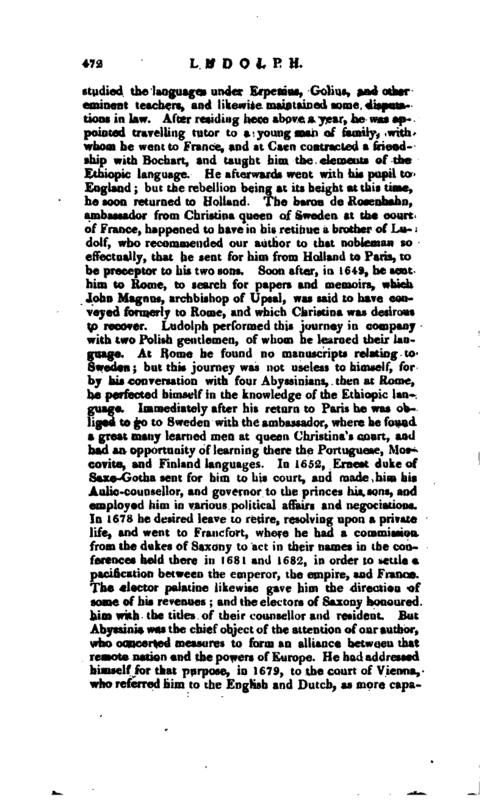 Ludolph performed this journey in company with two Polish gentlemen, of whom he learned their language. 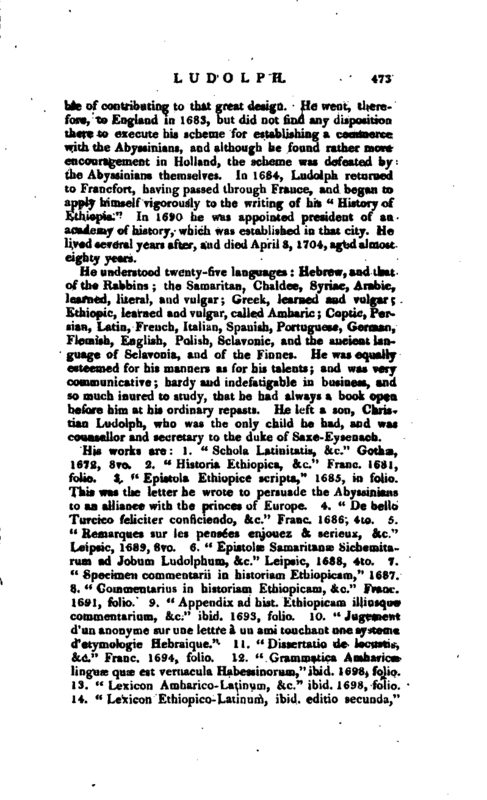 At Rome he found no manuscripts relating to Sweden; but this journey was not useless to himself, for by his conversation with four Abyssinians, then at Rome, be perfected himself in the knowledge of the Ethiopic language. Immediately after his return to Paris he was obliged to go to Sweden with the ambassador, where he found a great many learned men at queen Christina’s court, and had an opportunity of learning there the Portuguese, Moscovite, an. I Finland languages. In 1652, Ernest duke of Saxe-Gotha sent for him to his court, and made him his Aulic-counsellor, and governor to the princes his sons, and employed him in various political affairs and negociations. In 1678 he desired leave to retire, resolving upon a private life, and went to Fraucfort, where he had a commission from the dukes of Saxony to act in their names in the conferences held there in 1681 and 1682, in order to settle a pacification between the emperor, the empire, and France. The elector palatine likewise gave him the direction of some of his revenues; and the electors of Saxony honoured him with the titles of their counsellor and resident. But Abyssinia was the chief object of the attention of our author, who concerted measures to form an alliance between that remote nation and the powers of Europe. He had addressed himself for that purpose, in 1679, to the court of Vienna, who referred him to the English and Dutch, as more | capable of contributing to that great design. He vyent, there- i fore, to England in 168,‘i, but did not find any disposition there to execute his scheme for establishing a commerce with the Abyssinians, and although he found rather more encouragement in Holland, the scheme was defeated by the Abyssinians themselves. 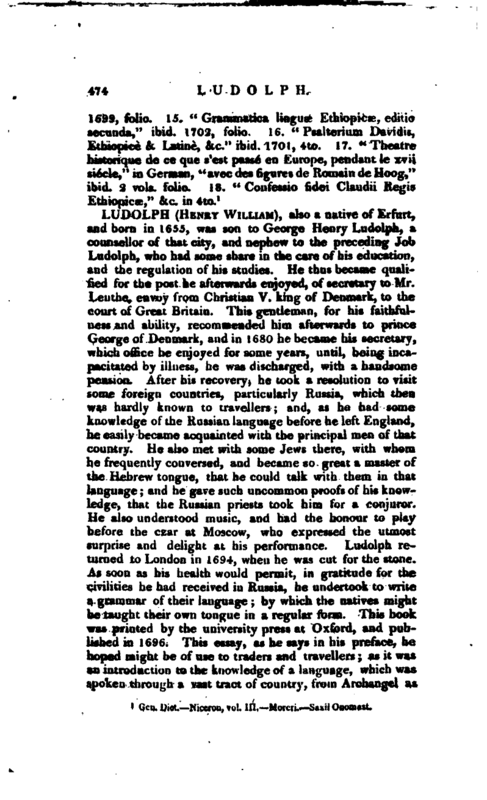 In 1684, Ludolph returned to Francfort, having passed through France, and began to apply himself vigorously to the writing of his “History of Ethiopia.” In 1690 he was appointed president of an academy of history, which was’ established in that city. He lived several years after, and died April 8, 1704, agfcd almost eighty years. 1 Gen. Dict.—Niceron, vol. III. —Moreri. —Saxii Onomast.